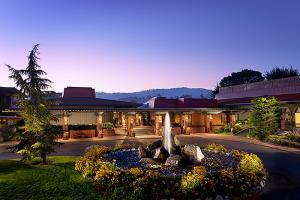 Transcend the ordinary at Hyatt Regency Monterey Hotel & Spa on Del Monte Golf Course. Multi-million dollar renovations elevate this splendid hotel to a new level of excellence. A spacious new lobby invites relaxation with a soothing fireplace and cozy seating areas - perfect for conversations or listening to live Jazz. Restyled accommodations redefine luxury with patios, flat screen TVs, walk-in rain showers and more. Located just 5 minutes from the Monterey Peninsula Airport. The Palm Court, The Plaza Food Hall by Todd English, The Rose Club, The Champagne Bar.